Your muscles are responsible for normal body movement and exercise. With that, it’s common to experience decreased function or pain due to lack of exercise, too much exercise or an injury. To improve your quality of life, there are a couple of treatments you may want to check out: Muscle activation technique and trigger point therapy. However, did you know that muscle activation technique is different than trigger point therapy? Both are great tools to use for mobility, but we want you to understand the differences. Muscle activation technique (MAT) is designed to improve and correct muscle imbalances which in turn improves overall function of your body. It’s used by professional and collegiate athletes to lengthen their athletic careers for an extended period of time. So, if your career uses the same muscle groups over and over again, muscle activation technique can be helpful for you. Trigger point therapy (TPT) differs from muscle activation technique and is seen as an alternative form of sports medicine. Trigger point therapy is used to alleviate aches and pains that are caused by knots in your muscles, not imbalances in the body. Many professional and collegiate athletes have found benefits of using trigger point therapy throughout their sports career if they have knots formed in their muscles. Learn More About MAT Now! Did you know that muscle activation technique and trigger point therapy can be used hand-in-hand to balance, correct and heal your body? Both may be exactly what you need to feel great on the field or court again. To learn more, we encourage you to reach out to our team here in Plano, Texas. Whether muscle activation technique or trigger point therapy is best for you, the execution is what really matters. Without the stimulating effect by one of our professional medical associates trained on this specific treatment, you’ll be left with tight muscles. A muscle activation technique session is similar to a trigger point therapy session, however, select muscles are treated in a specific order whereas trigger point therapy works to relieve singular tight muscles. There’s a theory about your muscles and them being connected to your nervous system. The theory is that your muscles and nervous system work together to prevent reduced function in different areas of your body. 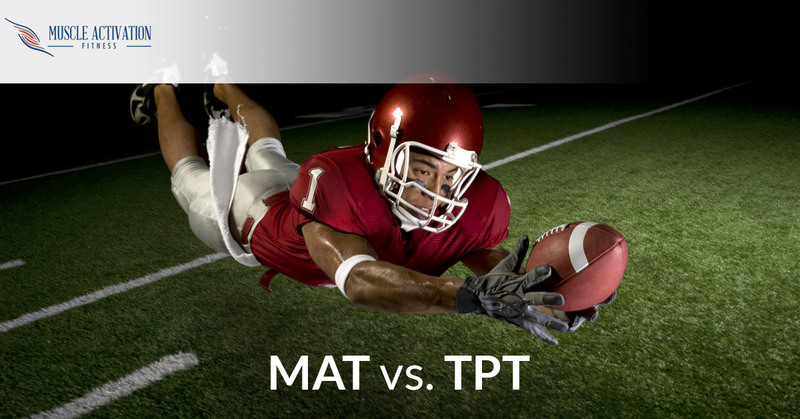 With MAT, muscles are treated with a specific manual therapy rather than just being massaged away (TPT). To learn more about muscle activation technique available at Muscle Activation Fitness in Plano, Texas, we recommend you reach out to us. Visit us online today or give us a call at 972-665-8336. We’re here to help you learn more about MAT, the process and how it can help you better your quality of life and performance on the field. To learn more about our science-based personal training, click here. In the meantime, read our blog!